Arguably some of the most unique and creative ballpark foods can be found at Turner Field, home of the Atlanta Braves. If you’re looking for chef crafted traditionals with a twist, this is definitely the place you will find it. From hot dogs to burger infused pizzas (or pizza infused burgers?) these talented food vendors have you covered-no matter what food mood you may be in. This is one of those “you have to try it” foods. The Everything Dog really lives up to its name and has a little bit of, well, everything on it. Coca-cola infused BBQ sauce, popcorn, tortilla chips, French fries, jalapeños, beer cheese, chili, and-of course-a foot long beef hot dog on a pretzel bun. It’s a smorgasbord of all things interesting, piled onto one deliciously meaty hot dog. Another interesting combination, the Punisher combines country-fried smoked ribs with monster energy drink-infused BBQ sauce. Served on a Hawaiian bun the whole thing is topped off with a beer-battered onion ring, slaw, and then held together with a couple succulent slices of candied bacon. What will they think of next? The best of both worlds is found in the Burgerizza. A cheese coated beef patty is served with bacon and placed between 8-inch Freschetta pepperoni pizzas. Topping choices include Fritos with chili and cheese sauce or Doritos with pulled chicken, pulled pork, and cheese sauce. This burger/pizza combination is enough to keep you full from the first inning to the last. Potato lovers will be scrambling for the Tater Tot Chop. It’s a tater tot waffle full of bacon, jalapeños, melted cheese, and sealed in with yet another tater tot waffle. The chefs at Turner Field must have a craving for soda infused sauces, because this entree is topped off with Coca-cola infused ketchup. Wow…where to begin with this creative creation? The genius behind this took a smoked sausage and cut it right down the middle to top with macaroni and cheese, pulled pork, mashed potatoes, and BBQ sauce with a cherry tomato on top. It’s a southern delicacy in the shape of an ice cream sundae-without all the ice cream. 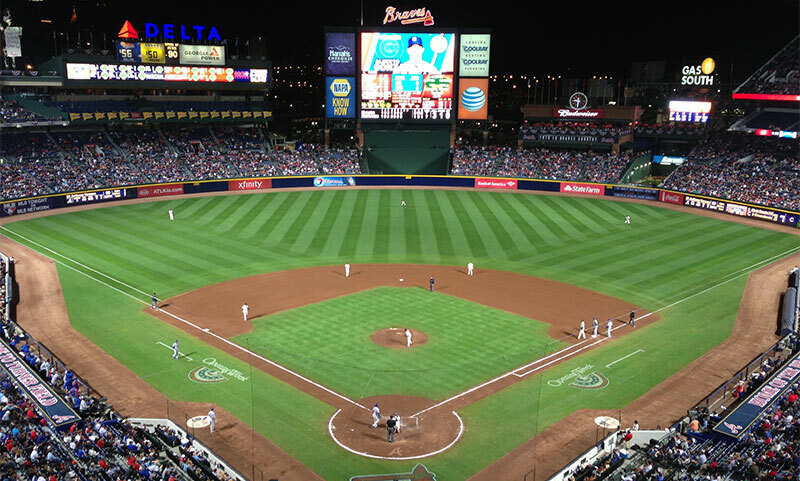 For the creative foodie, Turner Field is definitely a go-to place for interesting eats. The chefs behind these creations definitely put some time and creative energy into these entrees, and you are sure to be satisfied with any of the foods on this list. If you’re headed to watch the Atlanta Braves hit a home run this weekend, make sure to keep this list handy for all your food recommendation needs.